Quote: "Prepare to face defeat by my bleat! Baaaaaaaa~"
weight: NOE OF YOUR BISNESS> hehehehe. fav food: I like candy. butterfingers or kitkats are good :3 OOH! And reese's! since then she made it her lifes work to find Edward trunks, and her travels took her to the megaman universe where she joins Heaven's HAAAAAMMMMMAAAAAAARRRR. she is a queite shy person, but very loving all the same and a great teammate. 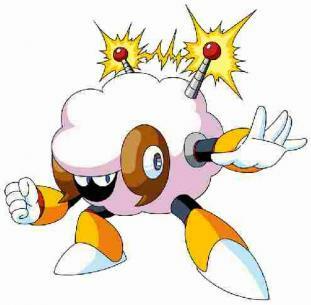 As the team pet, she pends her spare time in the Pyramid base making potions with her wool that controls the weather; she is assisted by five stardroid metools.